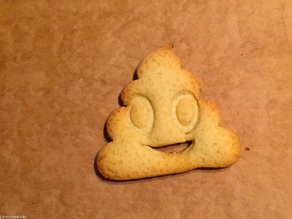 I made a whole tray of these cookies and they all looked like poop. Hahaha. Super stoked! My dough was a bit soft so they deformed a little, but these are great fun! Took some to my kids daycare party. The kids love them!!!! Topped with royal icing. Was fun to make different expressions.